Even with Narcan kits, first responders worry fentanyl is getting so powerful the antidote won't be enough. The CBC's Natalie Clancy looks at the raw reality of what is now considered to be Canada's opioid crisis. In Vancouver, on Dec. 13, nine people died of drug overdoses. Those nine deaths in a single night are part of an ongoing trend. Over the past year, Vancouver-area hospitals have treated more than 6,000 cases of drug overdoses. Over 70 per cent of those cases are dealt with in the ER at St. Paul's Hospital downtown. 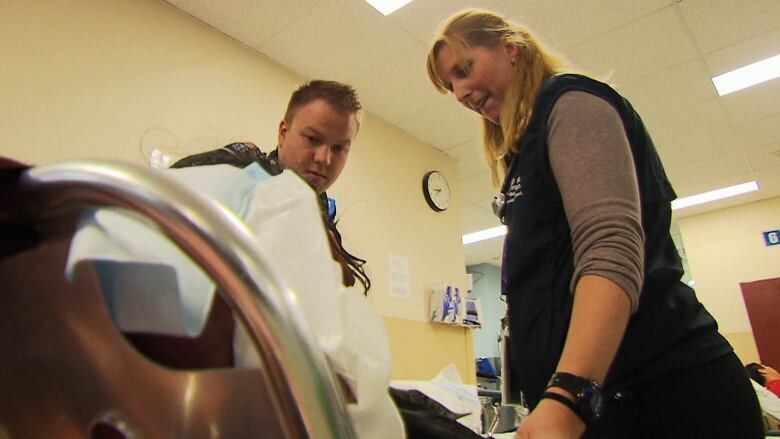 CBC reporter Natalie Clancyspent a shift in St. Paul's emergency department with the doctors and nurses on the front lines of the crisis at St Paul's hospital. "I wasn't breathing for about seven to 10 minutes," she says. "I honestly don't remember even doing the drugs." "Apparently, I overdosed," LaViolette tells Clancy. It was her first overdose. When paramedics picked LaViolette up at her friend's apartment, she was found outside on the road. "She didn't wake up until she got in the ambulance," says Tanya Campbell, the emergency department's nurse leader. "As you see her now she is awake, she's alert, but that doesn't mean she won't go back down," Campbell explains. Campbell says the number of overdoses she's witnessed is overwhelming and the patients appear to be taking stronger drugs. For the full story by CBC's Natalie Clancy on Vancouver's opioid crisis, read here. Tune in tonight to CBC TV's The National to watch Natalie Clancy's TV report. This documentary was produced by CBC's Natalie Clancy and edited by CBC's Alison Cook.